Harmonix will release this week its latest music video game Rock Band 4 for Xbox One and PlayStation 4. 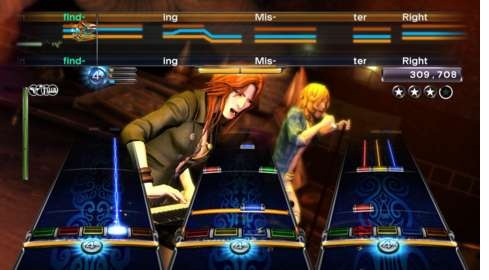 Those who have previously played the Rock Band, where they expanded their music arsenal by DLCs, may now import their old songs to the new game. Due to technical reason the transfer songs to Rock Band 4 will take a little time, since the import is currently carried out individually for each song. - Open the Xbox One Store or the expansion on the product page of Rock Band 4 on the PlayStation 4. - On the PS store page you can watch the results after free add-ons, filter to find the relevant songs. - Thus, the songs found and rock band 4 can be imported into, the console with the Gamertag or PlayStation Network ID must be connected, via the DLC songs purchased in previous Rock Band versions. - An import is only possible within a console family. So if Rock Band songs purchased on the Xbox 360 via DLC, this can not import them into the PlayStation 4. - However, transfer the re-download songs into the PS4 and PS3 versions of Rock Band 4 is possible. - There you can download the single with "Bought" famous songs. If there are problems during the import of existing Rock Band songs, take a look at the FAQ in Harmonix blog.